A licence to sell alcohol at a store in Dogsthorpe Road, Peterborough has been granted by city councillors, despite complaints that seven other shops in the area already do the same. Members of Peterborough City Council’s Licensing Act 2003 Sub-Committee granted the licence to Dins Kolosovskis for International Store last week. Speaking through his legal representative, Mr Kolosovskis explained that he and his wife had ambitions to turn the shop into a delicatessen, with food from their home country of Latvia, as well as other parts of Eastern Europe, but that the sale of alcohol was a financial necessity. Complaints were voiced from several residents, including Dr Barbara Patterson who said: “My property is just two doors down from this store and I don’t really want drunken people hanging around outside at all hours. 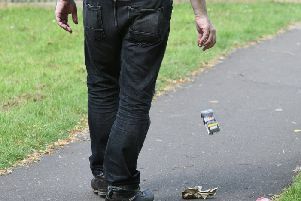 Richard Ferris, who resigned as a councillor this week, and who lives near the premises, pointed out that “litter and anti-social behaviour is already out of control and yet another alcohol outlet is detrimental to the area”. However, the police and city council licensing officer had no objections, only stipulating that the CCTV system must be high definition, that Mr Kolosovskis and all his staff complete the mandatory alcohol licence training, and that the hours selling alcohol be reduced from the requested 11pm to 9pm. With those conditions in place, and in a majority decision, members of the committee granted the alcohol licence, with the decision to be reviewed in a year.